Because gardening is such a healing activity health providers are trying to find methods whereby people with pain can continue working in their gardens. There are companies that have created ergonomic tools that are easier for people who may have crippling hands or wrist problems. There are ergonomic gardening tools for people with back problems.There are lumbar belts one can use for low back pain and knee pads for people with knee problems or to avoid knee problems. There are kneeling pads. Two such companies making these ergonomic tools are Radius Garden Tools and Gardening with Ease. They recommend that gardeners warm up a little with some stretching exercises and then not to work too long at any one task. Also be sure to have a bottle of water near by for the gardener to drink. Both the plants and the gardener should be getting a good drink. There are numerous books available that discuss gardening with limitations or disabilities. One is called The Able Gardener: Overcoming Barriers of Age & Physical Limitations by Kathleen Yeomanns. Another is called Accessible Gardening for People With Physical Disabilities: A Guide to Methods, Tools, and Plants by Janeen R. Adil. TheGardenLady always likes to borrow books out of my library, asking for them to get it through inter library loan if they don’t have the book. I only buy books if I find them good reference material that I want to keep. 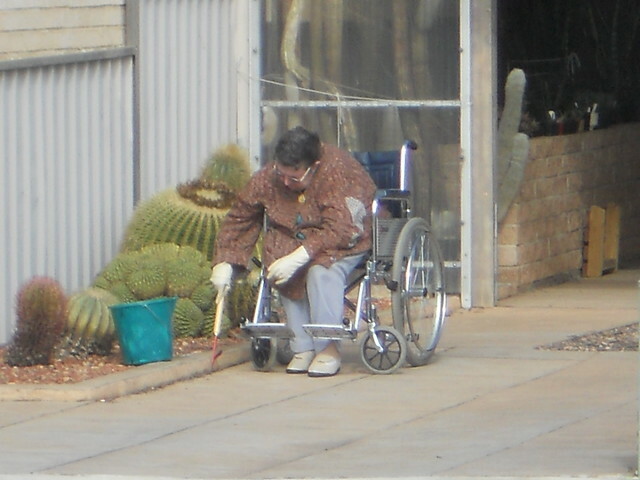 If you or someone you know loves to garden but has physical limitations, don’t despair and don’t give up your gardening. There are methods to help. Also, if you or someone you know has had success gardening with physical limitations or know products that you can recommend, please share your knowledge with the readers of TheGardenLady blog. .